Note: This post refers to breastfeeding as nursing and avoids the use of gender-specific language in order to remain inclusive. For more information about this, visit the links here and here. Too many parents are faced with the difficult choice between earning an income and caring for their newborns. As National Breastfeeding Month 2018 comes to a close, it is important to consider barriers that new parents face to nursing their infant and what opportunities exist to better support new parents. The American Academy of Pediatrics recommends exclusive nursing for the first six months of an infant’s life, followed by nursing that is supplemented with complementary foods for an additional six months. However, data from the CDC show that only 25 percent of infants are nursed exclusively for the first six months and only 36 percent are nursed at 12 months of age. Despite overwhelming evidence demonstrating the short- and long-term benefits of nursing for both parents and infants, families can face tremendous barriers to adhering to the recommendations. These include challenges with lactation, poor social supports, barriers to health services, limited knowledge of the benefits of nursing, embarrassment, and challenges relating to employment and child care. It is also important to recognize that many new parents are unable to nurse their infant for reasons that include medical conditions and contra-indications, situations of foster care or adoption, cases where caregivers are not the birthing parent, and more. NC Budget and Tax Center, What's Race Got To Do With It? In NC Budget and Tax Center, What's Race Got To Do With It? Infant mortality data reveal longstanding economic and social disparities that exist along racial and ethnic lines — disparities that are actually getting worse in many cases. Overall infant mortality has declined from 1991 to 2016, as the number of deaths prior to age 1 per 1,000 live births in North Carolina declined from 12.2 deaths to 7.2 deaths. However, when disaggregated by race and ethnicity, the data tell a more complex story. The infant mortality rate is declining more rapidly for white children compared to many communities of color. From 1997 to 2016, the rate declined 22 percent for white infants but only decreased by 14 percent for African-American and Black infants. Mortality among Hispanic and Latinx infants actually increased by 25 percent during the same time period. The more rapid decrease in infant mortality for white infants has compounded disparities that already existed across groups. Deaths among Hispanic and Latinx infants have historically been closer to white infant deaths, though there has been an increase in the percentage of Hispanic and Latinx infant deaths from 1997 to 2016. These changes equate to an increase from 2.2 to 2.68 times the number of African-American and Black infants, meaning that for each white infant that dies per thousand births, there are nearly three African-American and Black infants who die. For Hispanic and Latinx infants, these rates increased from 0.68 to 1.2 deaths for each white infant that dies per thousand births from 1997 to 2016. In addition, if the disparity gap were closed and the white infant mortality rate was reflected across all racial and ethnic groups, 238 fewer African-American and Black infants and 19 fewer Hispanic and Latinx infants would die each year. These growing gaps in infant mortality are rooted in disparate access to economic opportunities and resources that impact health. While two leading causes of infant death in the United States are attributable to preterm births and birth defects, the underlying root causes point to social factors such as family income, access to health care and insurance, access to prenatal care, mother’s education, and experiences of discrimination and systemic racism. Addressing and eliminating racial barriers to economic opportunity is a vital step in protecting infants and giving everyone in North Carolina the chance to live full and healthy lives. Suzy Khachaturyan is an MSW/MPH intern with the NC Budget & Tax Center. African American infants now die at more than 2.5 times the rate of white infants in N.C. In 2010, the state of North Carolina identified 13 major health focus areas and established 41 decennial health objectives and targets to meet by the year 2020. As part of the state’s ‘Healthy NC 2020’ improvement plan, the state identified Maternal and Infant Health as a focus area and developed three objectives through which to track progress. Recently released data show that North Carolina has made some progress on two of its three maternal and infant health objectives since 2008, but has failed to make any progress in reducing the racial disparity that exists between whites and African Americans. Today, the state’s infant mortality disparity between white and African American infants is greater than it was in 2008, while the overall infant mortality rate and the percentage of women who smoke during pregnancy have reduced slightly. In order to meet 2020 targets, North Carolina needs to do more for maternal and infant health. Infant mortality – or the number of infant deaths before age 1 for every 1,000 live births – is widely recognized as an important indicator of a state’s overall health. 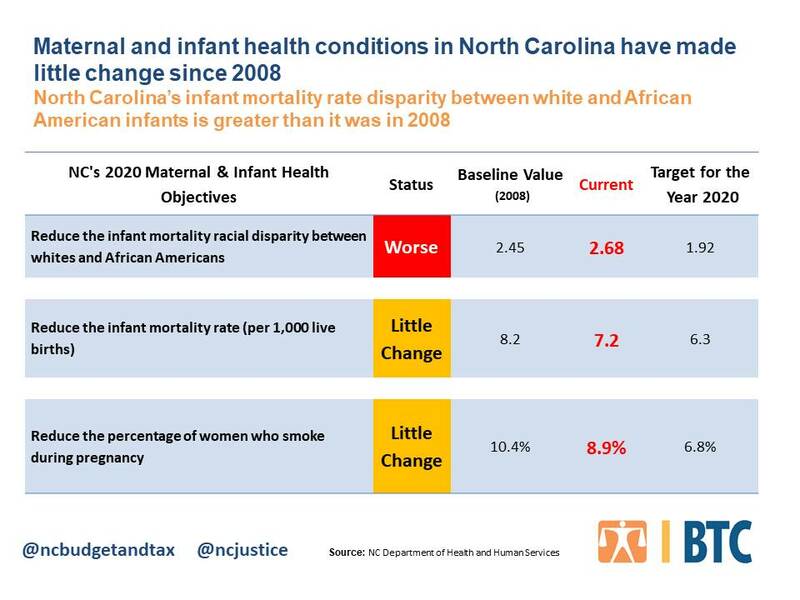 This measure has long been a focus of public health work in North Carolina, and while the overall rate is improving, the worsening racial disparity between white and African American infants reflects poorly on our state. With African American infants dying at more than 2.5 times the rate of white infants, there is a great deal of work to do to address the inequities that lead to these dire outcomes. 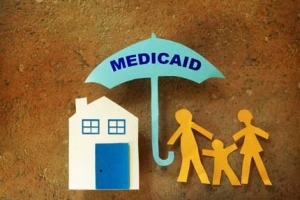 Currently North Carolina is preparing for changes to how Medicaid services are delivered and is making plans to address social determinants of health. This transformation presents an opportunity to make a big impact by addressing inequities that lead to poor health and could lead to improvements in maternal and infant health, in addition to many other areas. Suzy Khachaturyan is an MSW/MPH intern with the Budget & Tax Center, a project of the North Carolina Justice Center. President Trump may want people to believe he ended his devastating policy of separating children from their families at the US border, but his reversal (and subsequent back and forth confusion) doesn’t turn back the clock for those who have already been separated, and does not end the mistreatment of families seeking refuge through asylum in the United States. Trump’s order also fails to lay out a humane policy for how families and children will be treated going forward, an omission that will likely lead to even more trauma for immigrant families and ongoing legal wrangling. Most recently, 17 states including North Carolina filed a suit against the Trump administration, and, in a separate lawsuit, a U.S. district judge ordered that border authorities reunite children with their families. Trump’s executive order is no act of heroism, but rather an insufficient response to a crisis created by his own administration’s cruel policies. More than 2,000 children have been separated from their families at the border since the “zero tolerance” policy took effect in early May as part of the administration’s latest attack against immigrant families. Family separations drew widespread condemnation from professional groups, including the American Academy of Pediatrics, the National Academy of Sciences, the American Psychological Association, the National Association of Social Workers, and thousands of individual mental health professionals. 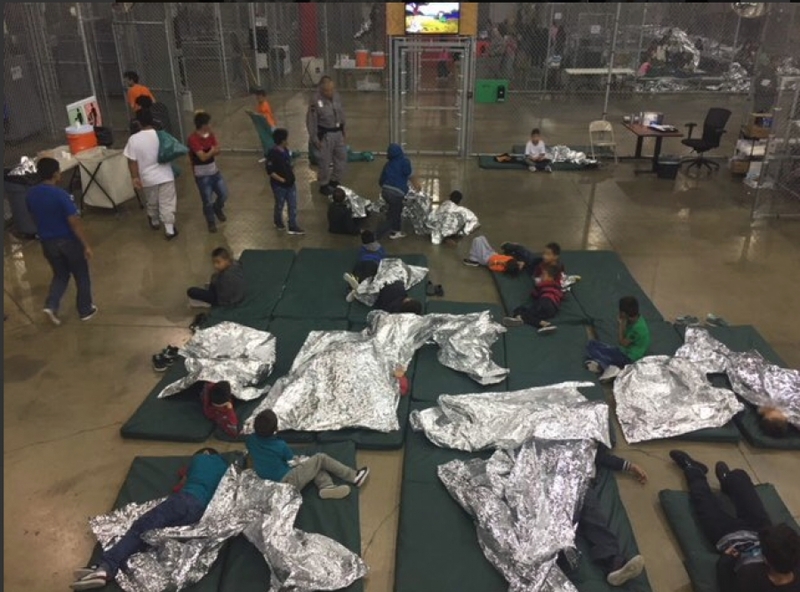 Health professionals point to a range of short- and long-term harms that family separation imposes on children. In the short term, serious cases of traumatic separation, reactive attachment disorder, and sustained toxic stress lead to a range of coping strategies, including aggression, withdrawal, self-harm, anxiety, depression, and sleep problems. These adverse childhood experiences (ACEs) can undermine long term health, increasing the risk of heart disease, diabetes, and substance use disorders, and inhibiting the formation of healthy relationships. In addition to the events at the U.S.-Mexico border, families currently residing in the United States are being separated in ICE raids, most recently in Ohio, North Carolina, and Tennessee. These, too, result in families being torn apart, have a similar negative impact on children, and are issues of concern to medical professionals, teachers, social workers and more. These traumatic experiences will continue for children whose families face the daily fear of deportation, and for the thousands of children who have already been separated from their families. Virginia votes to expand Medicaid for some. We can do better. Last week, North Carolina’s northern neighbor, Virginia, voted to expand Medicaid coverage to 400,000 low-income residents, making it the 34th state to do so since the passage of the Affordable Care Act in 2010. If North Carolina wants to compete with our southern neighbors, as we so often hear in policy debates, now is the time for policymakers to move ahead with closing our state’s coverage gap. They should do so for everyone, demonstrating their leadership by passing a more comprehensive coverage plan that doesn’t include red tape or exclusions. Virginia’s state legislature voted to extend coverage to many uninsured Virginians. However, the inclusion of requirements that those eligible work a minimum number of hours each month will limit coverage for an estimated 50,000 individuals who would otherwise be eligible for coverage. It is a move that doesn’t acknowledge current labor market realities and is likely to cost the state more to implement. So-called “work requirements” create significant administrative burden for states, and will cost Virginia approximately $1.2 million in the next two years alone. Furthermore, work requirements do not address the root causes of poverty, and they generally exacerbate the problem. Data show that almost all adult Medicaid recipients who do not work either have a disability, serve as a caretaker to family, attend school, are retired, or could not find work. These requirements hurt most enrollees, including the most vulnerable, such as children, adults with disabilities and those with substance use disorders, as enrollees wrestle with complex administrative requirements for reporting and documenting their work hours each month. Let Virginia’s restricted expansion of health coverage be a signal for North Carolina lawmakers to enact better, evidence-based legislation that demonstrates their commitment to promote the health and well-being of all in our state.